The Low Carb Breakfast Sandwich is a fickle and often times elusive beast. 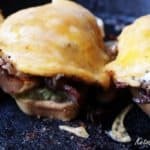 It’s a shame too, because prior to starting keto, I was an expert on breakfast sandwich engineering (self-proclaimed, but my friends will vouch for this!). I would bake my own english muffins and cure my own bacon. I did it all. There was no length I wouldn’t go to achieve the perfect breakfast sandwich. In fact, if I ever wind up on death row, my final meal will undoubtedly include a couple breakfast sandwiches. 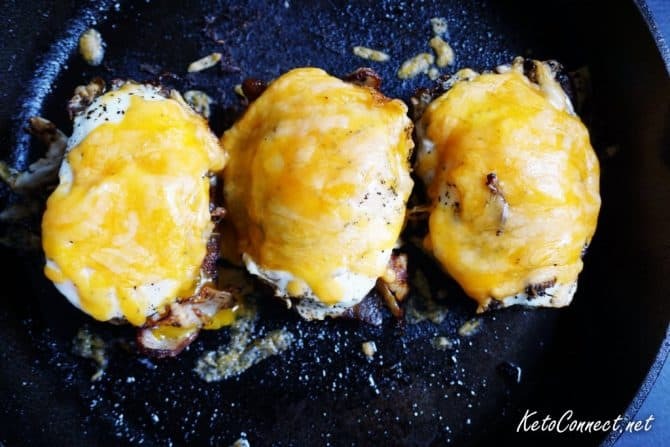 When I started Keto, I begrudgingly gave up my go-to breakfast delight. Don’t get me wrong, I enjoyed, and even looked forward to my delicious new breakfast of eggs, bacon, and avocado, but every now and again I would long for a breakfast sandwich on a Sunday morning. Finally, after a few months, I had enough! I made it a goal of mine to conquer the Low Carb Breakfast Sandwich, just as I’d done with it’s gluten-laden counterpart a few years prior. The road would be long and arduous, but I wouldn’t be denied! It wasn’t long after Megha and I began to experiment that we hit the first roadblock and it was exactly what we had expected. Keto bread. It just can’t compete with the real thing. We must have tried half a dozen different recipes, tweaking them along the way. We just couldn’t get the consistency down. I’ve concluded that 95% of Keto breads fall into one of two categories. They are either rocks or clouds and nothing in between. You absolutely need something in-between for the perfect low carb breakfast sandwich. If you use a cloud, it will turn into soggy newspaper by the time you go for your second bite. If you use a rock, all of the ingredients fall out of the opposite end when you take your first bite. The consistency of the bread is paramount! Then it finally happened. We pulled a mini loaf pan out of the oven and I looked at Megha much the way I imagine Thomas Edison looked at his associates when he finally figured out the light bulb. We’ve done it! After what seemed like weeks of trial and error we have finally conquered low carb bread! 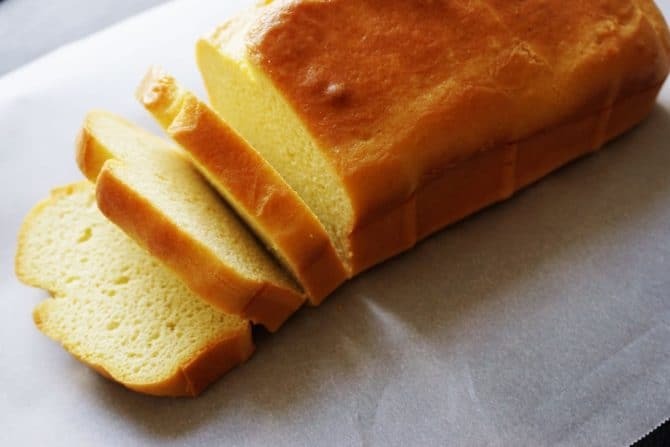 Here’s the recipe to The Best Keto Bread on the Internet, which is absolutely necessary for pulling off the perfect low carb breakfast sandwich! Now that we’ve got the keto bread down, we’ve got some decisions to make, and the type of meat you go with is the most pivotal decision on the path to perfection. The trick is, you don’t have to pick just one! In fact, I would recommend a minimum of two meats. You need to consider flavor profiles as well as textures when making this decision. For those reasons I think locking in bacon right off the bat makes the most sense. 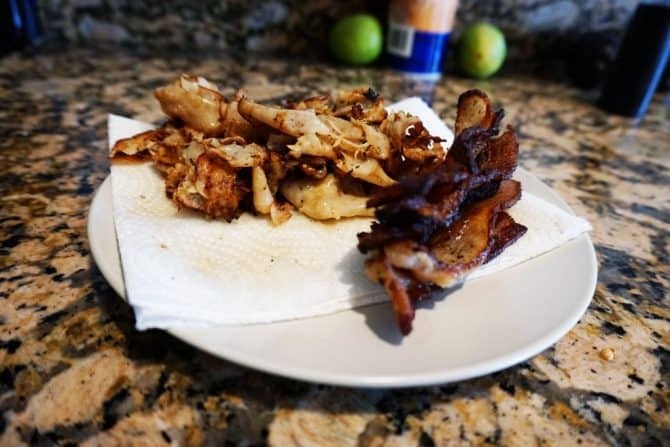 It provides great flavor as well as a nice crunch which can be hard to find in Keto cooking. For meat #2, get creative. We’re going to opt for sliced chicken breast and here’s the best part. We’re cooking it in the bacon grease. Hello, flavor! Nothing separates an average low carb breakfast sandwich from a good, or even a great one more than how the egg is cooked. This is everything! In my professional opinion there are only two options. Poached or Sunny Side Up. The runny yolk ties together all the flavors and is a non-negotiable element of this low carb breakfast sandwich. I prefer going Sunny Side Up, because that gives us the opportunity to put the bacon grease to good use for a second time. Just throw the eggs in the same pan you cooked everything else in. Pro Tip: Use the fattiest pieces of bacon you can find. We’re going to be using that bacon grease each step of the way! In order to keep the bread from getting too soggy and to add fresh flavors to the sandwich, a spread is critical. You can use your imagination here. There are lots of options. I don’t think anything can compete with guacamole though. Not only is it perfect for keto, but it compliments our current flavors perfectly! If we aren’t making our own from scratch, I like to look for one with some tomatoes in it as the acidity really helps cut through all the of fat we have in play in this low carb breakfast sandwich. Out of all the decisions that need to be made when constructing the perfect low carb breakfast sandwich, the cheese selection is the least important. You really can’t go wrong with anything shredded or sliced that melts halfway decently. If you want to play it safe, Cheddar or Provolone is what you’re looking for. We went with cheddar in this recipe, but we’ll often get adventurous with whatever we have in the fridge. The Last Step, and It’s an Important One! Oh, did I mention we’re making this open-faced? I go for an open face sandwich because it allows us to use the same amount of ingredients and only one slice of bread. Also, it opens up the option to pop this puppy under the broiler for a few minutes, which is exactly what we’re going to do! Assemble: Bread > Guacamole > Bacon > Chicken > Egg > Cheese. Place under a broiler for 2-3 minutes. We want the cheese to melt and bubble up just a bit. You’re ready to eat! Optional: If you’re a sandwich purist you can top this off with another piece of bread. I prefer to dig in with a knife and fork though. Start by baking a loaf of KetoConnect's signature bread! Place bacon in a skillet or non stick pan and cook until crispy. Set aside, on a paper towel. Next, cook the Roast Chicken slices in the pan with the bacon grease and cook until partially crispy. Set aside, on a paper towel. Cook a sunny side up egg in the same pan as the chicken/bacon. We want the egg white to be cooked through, but the yolk still runny. Once egg is done, set aside. Slice a piece of bread and spread on the guacamole. Next add bacon, then chicken, then the egg, and finally, top with shredded cheese and oregano if desired. Place on an oven safe pan. Turn on the oven to broil. Place sandwich under the broiler for 2-3 minutes, or until cheese is completely melted. Enjoy!